Train derailment in Quebec and Keystone XL pipeline. A Limerick. – Len Bilén's blog, a blog about faith, politics and the environment. 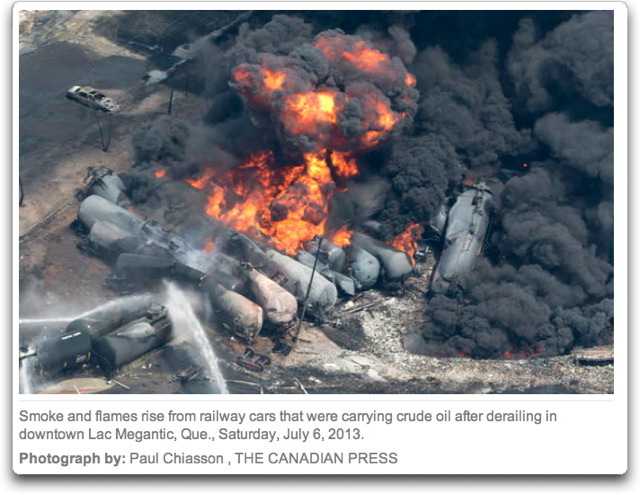 Train derailment in Quebec and Keystone XL pipeline. A Limerick. its crude-oil exploded the wreck. Use a pipe-line of course. The Keystone will thwart the OPEC. Obama mentioned more than 20 times “Carbon pollution”. In his weekly radio address the following Saturday he mentioned it again, without specifying what he means by “carbon pollution”. Right now the crude oil is transported from the Athabasca tar sands to Houston by Warren Buffet’s Burlington Northern Santa Fe LLC railroad. It is among U.S. and Canadian railroads that stand to benefit from the Obama administration’s decision to reject TransCanada Corp. (TRP)’s Keystone XL oil pipeline permit. Comparing to this, pipe-lines ate much more environmentally safe, and does the job for less than half the cost of railroad ttansportation. If you were Obama, what would you do? Would you do the economic and environmentally friendly thing, or would you continue to favor your crony capitalist friends and the powerful OPEC? Previous Previous post: The jihadist in the White House. A Limerick. Next Next post: Go green like Spain? Obama’s dream. A Limerick.